Cruise & Maritime Voyages has been loaned Azores‘ original ship’s bell which will soon be displayed on-board. Rosalea Ryan, a regular passenger on board Azores and a writer, has donated the bell on loan while the vessel continues to operate under the CMV brand. Azores started life as Stockholm in 1946 and gained notoriety in 1956, when in heavy fog the ship collided with the Italian Line ship Andrea Doria in the North Atlantic. Both ships sustained damage with the Stockholm bow badly smashed. Despite the damage Stockholm managed to carry off and save 327 passengers and 245 crew members before the Andria Doria capsized and sank. 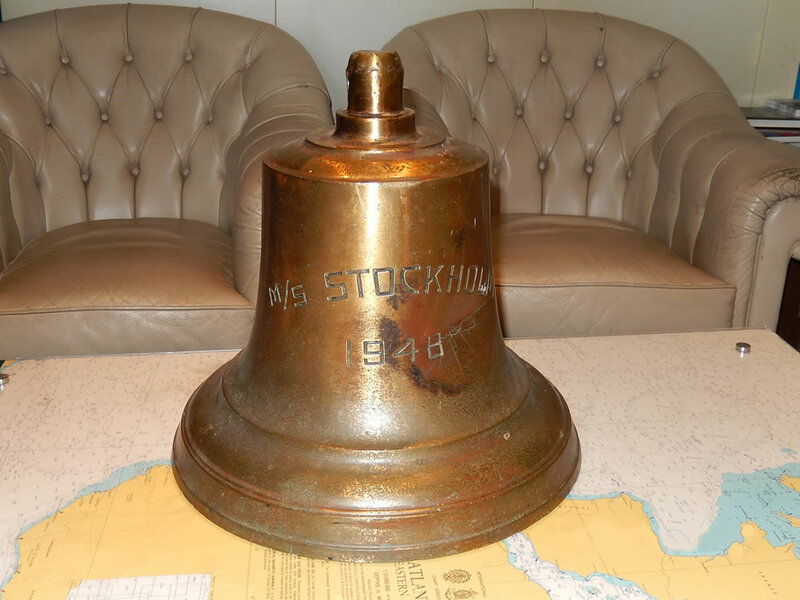 It was during this incident that Stockholm lost its ship’s bell which was originally installed on board in 1947. The bell became tangled in the wreckage of Andrea Donia sinking with it. Subsequently, a diver looking for artefacts from the wreck found it. Later it was traded for boat parts in the USA. More recently it was offered for sale and Rosalea Ryan bought it before offering it to the safe custody of CMV to display on board. The bell measures 35cm in height, 36cm in diameter and weighs 75 kilograms (11st 11lb). A spokesperson for CMV has said that the bell is likely to be placed in the shop display area near to the entrance to the piano bar on Calypso Deck. Ms Ryan is booked to cruise on board Azores sailing on 15 June to Iceland and the Northern Isles when she hopes to be able to see the bell proudly displayed on board. The bell is expected to remain on-board while Azores, or Astoria as she will be renamed to following the completion of the summer 2015 season, continues to sail under the CMV brand. Following this loan to CMV the bell is then expected to join other original memorabilia in the Maritime museum in Gothenburg.